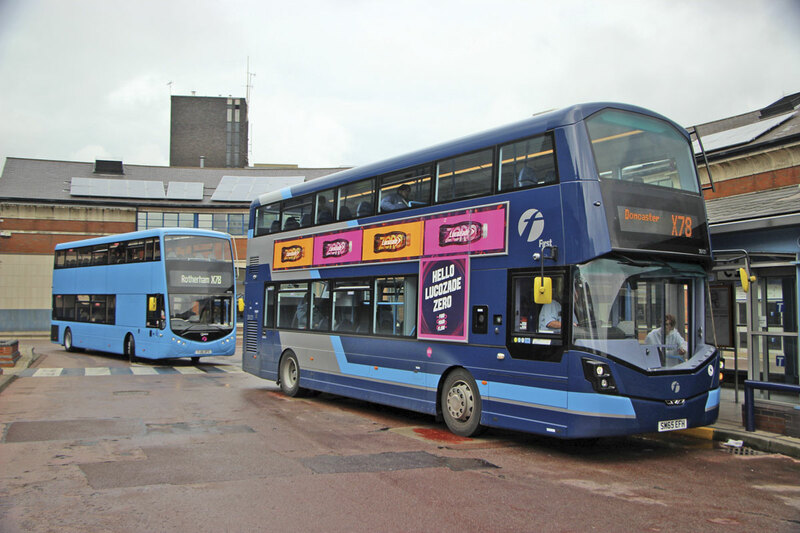 First Bus’s efforts to ensure that the vehicles it purchases deliver the best efficiency it can buy have seen the company carry out regular detailed tests on a full range of bus products at Millbrook over a number of years. Successive tests have been honed to relate them as closely as possible to the conditions the fleet actually experiences, rather than Government test cycles, and the results gathered used to inform procurement decisions. In addition, First carries out rigorous in service testing of manufacturer supplied demonstrators to determine their real life performance. 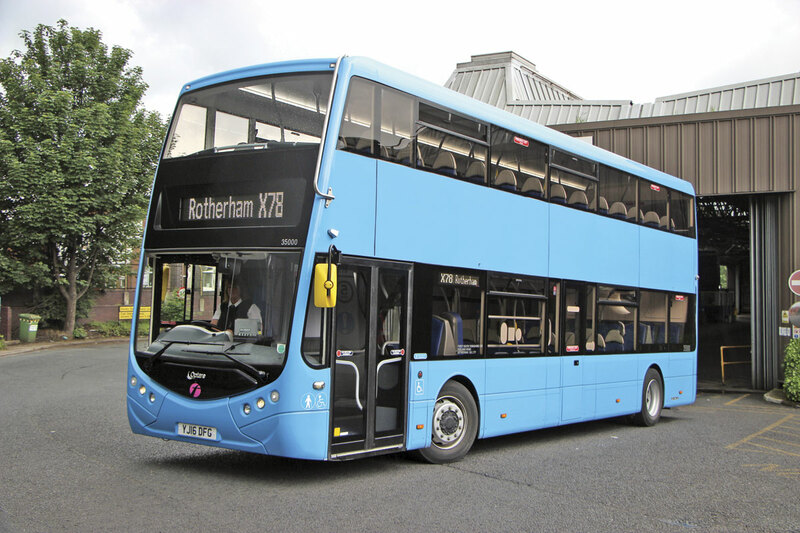 The latest of these tests is being run from First’s vast Rotherham depot in South Yorkshire using a pre-production version of the Optare Metrodecker. 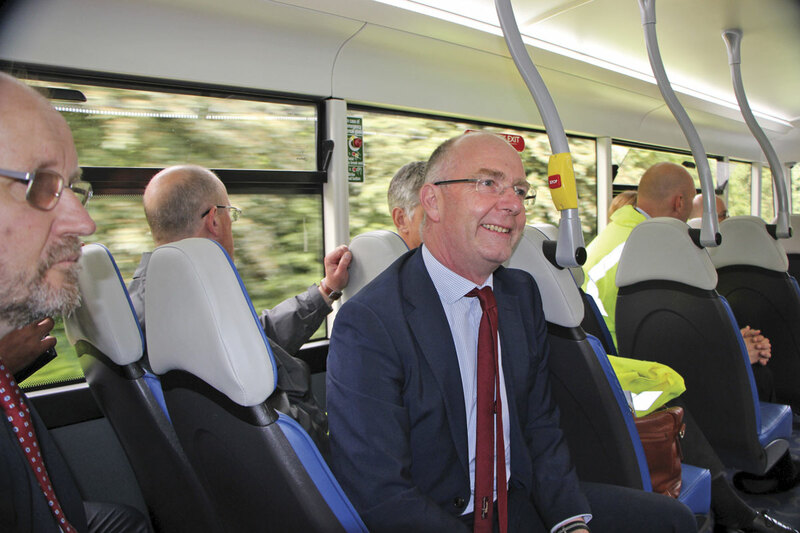 Last week members of the press were invited along to see the bus, travel on it in service and meet members of the Optare and First Bus teams to talk about the project. I was told the bus involved is the sixth pre-production Metrodecker to be built and is an 11.14m single door variant. 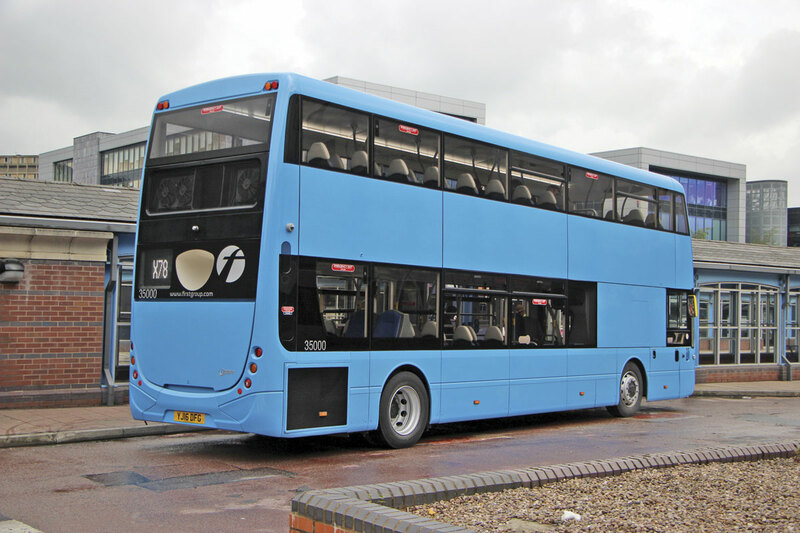 Optare also offers a 10.5m long dual door version. 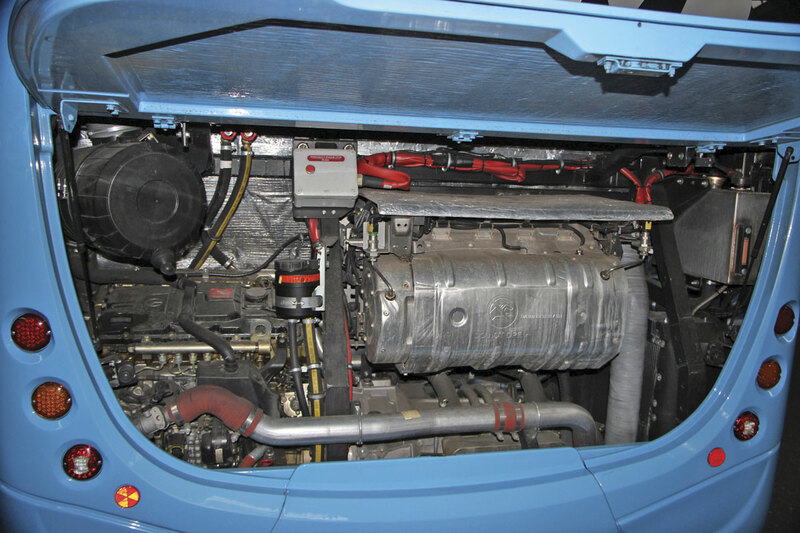 The fully integrally built Metrodecker is powered by a transversely mounted Mercedes-Benz OM934LA four-cylinder Euro6 5.1-litre engine producing 170kW/228bhp at 2,200rpm and torque of 900Nm at 1,200rpm. This is tilted by around 20 degrees to enable access to it to be optimised. It is matched to the ZF EcoLife 6AP10000B six-speed fully automatic transmission with Topodyn adaptive shift control. At the front the ZF RL75EC fully independent suspension system is used and the rear portal axle is the ZFAV132 with 6.2:1 ratio and Knorr Bremse SB7000 disc brakes. Steering is the ZF8098 with integral power assistance. Built to an overall width of 2.50m rather than the maximum 2.55m, the overall height is 4.31m and the wheelbase is 6.0m with front and rear overhangs of 2.76m and 2.386m respectively. The turn radius is 9.142m kerb to kerb and 10.955m wall to wall. The capacity in both length variants can be a maximum of 99 and in the 11.14m the highest seating capacity is 84 plus 15 standees (10.5m is 63+36). The evaluation bus, like the vehicles used on the X78, has Civic V3 seats trimmed in E-leather, giving a total capacity of 98 and a seated capacity of 83 split 51/32 between the upper and lower decks. 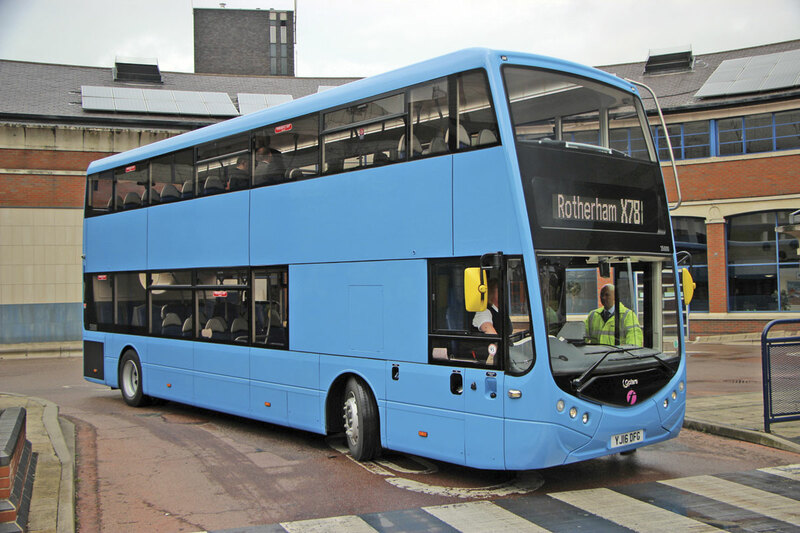 The Rotherham depot, with its vast covered garage area and an equally impressive engineering facility alongside, is home to a large fleet of buses. The service on which First is employing the Optare is the flagship X78 service between Doncaster, Rotherham and Sheffield which takes in Meadowhall en route. 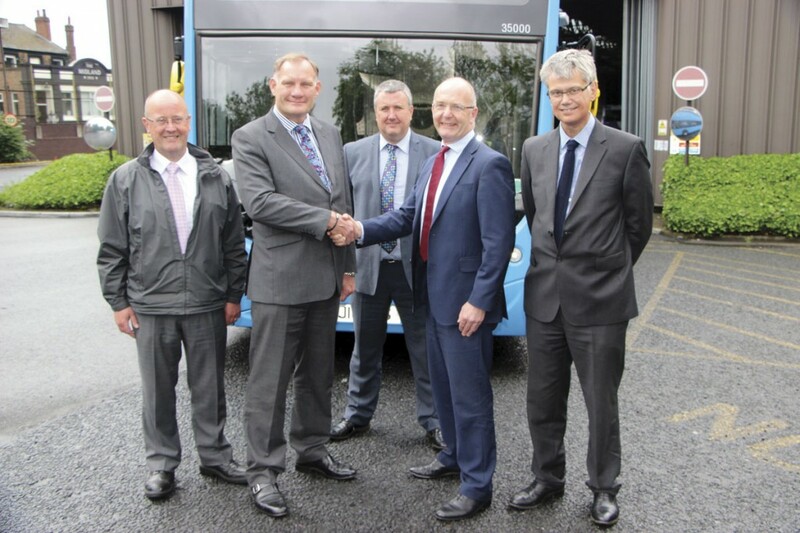 Graham Belgum is now ten weeks into the role of President of Optare having previously been the company’s Aftersales Director for 12 months. He explained that the double decker was a journey that the company had set out on three years ago, pointing out that, without it, the company did not have access to half of the market. He reconfirmed Optare’s plan to offer a full electric version, mentioning TfL’s decision that it would not be taking any more diesel only double decks. Though Graham declined to say when the full electric would be ready, the latest step towards full electrification had recently been accomplished with the signing off of a new electric steering system for the Metrodecker. 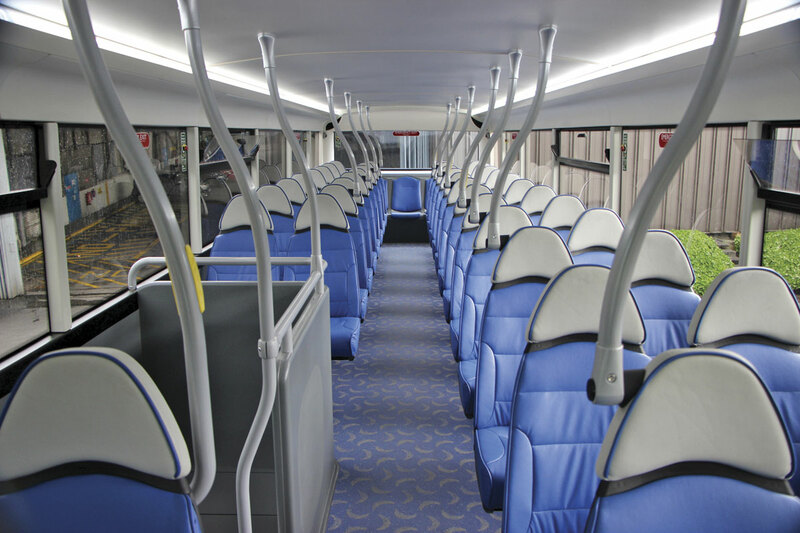 Weight reduction is a key driver in Optare’s future design planning, the objective being to produce a bus with a structure that is as light as it can be to do the job. Operators can then add whatever features they require. The ULW shown on the side of the evaluation vehicle was 10,860kg which Optare claim is a best in class figure. The vehicles currently operating the X78 show a ULW of 10,407kg but they are 0.5m shorter with a lower passenger capacity. He stressed the importance of ensuring that First bought buses that were efficient saying that small differences were important to help reduce the annual First fuel bill (which was £180m in 2014). He believed the in service testing was important and said that previous tests had produced results reflecting the findings First had obtained at Millbrook. This reinforced that the Millbrook exercise was accurate and worth doing. First will provide detailed feedback in a post trial meeting and are also giving Optare less detailed impressions while the trial is going on. 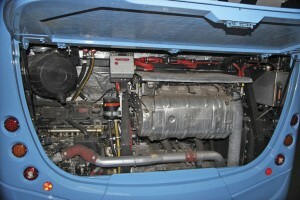 The operator did have some input into the detail specification of the bus, particularly in the cab area, to ensure that it fitted in with the use it was being put to. Accompanying Mark Munday was Peter Manning, First Bus’s Systems Engineer for Chassis & Drivelines and they said that to achieve meaningful comparisons, ‘You need a mature leadership team to get the most out of the trial. Rotherham has the team that can do it.’ Representing First’s local management team were Paul Flanagan, Business Manager – South Yorkshire and Ian Plant, Rotherham’s Engineering Manager, who will retire in August after 44 years experience with the company and its predecessors. First Bus has not been a prolific purchaser of Optare products in recent years, though it did buy a batch of full electrics for its operations in York last year. I was told that there are no Optares currently operating for First’s three South Yorkshire depots; Rotherham, Sheffield and Doncaster. 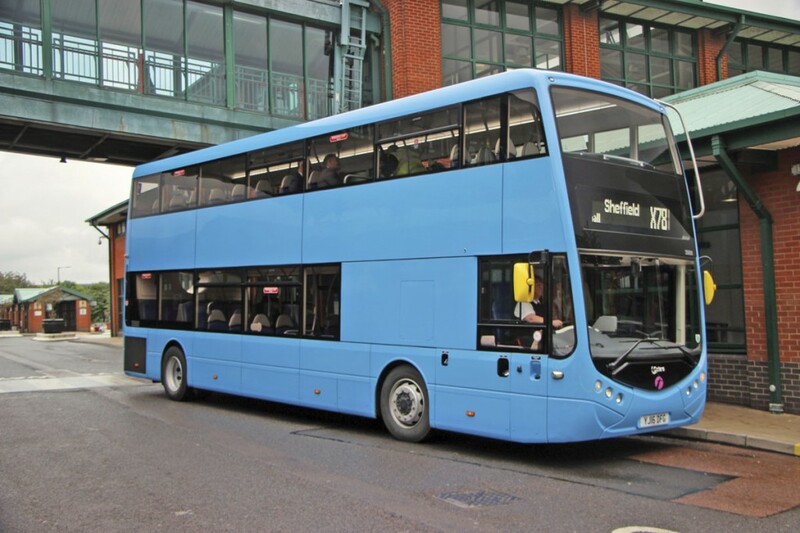 Currently operating the X78 are 20 Wrightbus StreetDecks in a special predominantly dark blue livery with prominent branding. The PVR on the route was recently reduced. Prior to the Streetdecks, Wrightbus bodied Volvo B9TLs were the order of the day. First Bus told us that drivers at Rotherham were positive about the Metrodecker, which has been running there since mid April. Some drivers had mentioned a perceived slight inferiority in the turning circle compared with the StreetDecks, but this was almost certainly because of the Optare’s longer wheelbase, a consequence of it being 11.14m long rather than 10.6m. One minor criticism was that the pocket within the cab door moulding provided for her bag was not big enough to hold it and she had had to stow it on the cab floor to the left of her seat. Nevertheless, she found the cab was quite spacious, mentioning that on some buses her knees touched the dash unit, but they did not on this. Other positives were ‘spot-on’ steering and ‘a nice bright atmosphere’. For my own part, I shared one of the First Bus team’s observation that the upper deck blown air system was quite noisy but otherwise found the journey comfortable and smooth, indeed the driveline sounded very well matched with no obvious gear changes. It didn’t seem to struggle at any point. The Metrodecker is not the first vehicle that First have evaluated on the X78. Earlier trials included the MCV Evoseti Volvo B5TL and the ADL Enviro500 MMC. The idea is that by testing on the same route the results should be more directly comparable. Mark Munday stressed that the engineering team was rigorous in the methodology used in its comparisons. As well as this trial, First is also evaluating the Optare MetroCity single decker with a similar in service trial taking place from Halifax depot in West Yorkshire this summer. 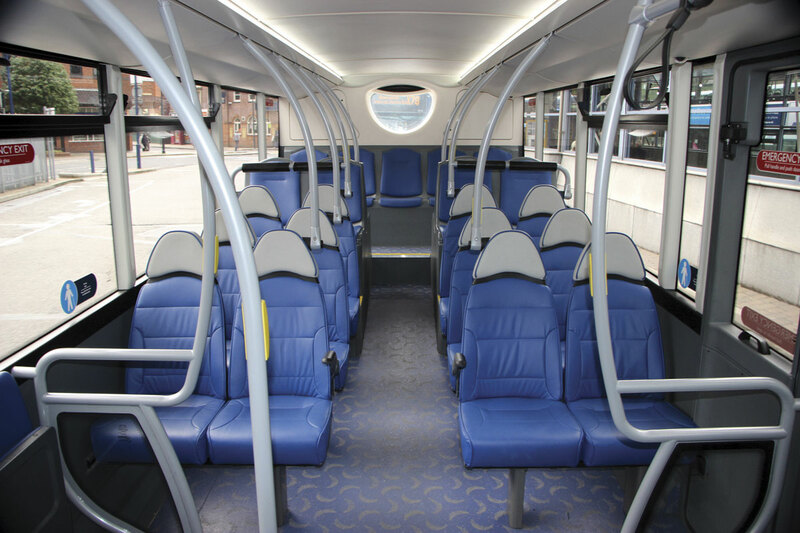 The trial of the Metrodecker will end in mid August after which the bus will return to Optare for the installation of the new electric steering system and it will then go on another trial with an undisclosed major bus group.